SNHN has begun work on its largest population health needs analysis the Needs Assessment. 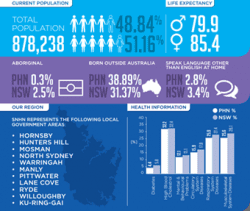 Through a systematic method of identification, the Needs Assessment will shed light on unmet health and healthcare needs of the Sydney North population. Analysis of relevant and current local and national health data. Review of health service needs and available service provision in the region. Identification of health service priorities based on an understanding of the healthcare needs of the community. The Needs Assessment will contribute to the development and implementation of an evidence-based SNHN Annual Plan which will address national and local priorities relating to patient needs, service availability and gaps in the Sydney North region. The completed Needs Assessment is due at the end of March 2016. For more information about the Needs Assessment, the Federal Government has created a Needs Assessment guide for PHNs. Sydney North Health Network in collaboration with the Australian Institute of Health Innovation, Macquarie University and Primary Care Services at Macquarie University Clinic are seeking expressions of interest (EOI) from health partners including other PHNs interested in the proposed research and development of a mobile health app for people at risk of Chronic Disease. The mobile app will be designed to provide information about the risks of developing chronic diseases, seek preventive measures and encourage early intervention to a target group who do not see a GP regularly (approx. 40 – 49 years). During the research phase, those at risk of chronic disease will be encouraged to visit their GP for further assessment (e.g. lipid screening test). This mobile app will be evaluated using a randomised controlled trial. Research Rationale: Many people at risk of developing chronic diseases have limited or no contact with primary care providers. Often they only seek medical advice when they have already developed early onset of the disease. How can we encourage those at risk, who do not regularly see their GP, to seek preventive measures and early intervention for major chronic diseases? This research is conducted by the Australian Institute of Health Innovation, Macquarie University. A submission of the research proposal is due to the National Health and Medical Research Council (NHMRC) by mid-February. Your expression of Interest is required by February 10. To express your interest or for more information: Please contact Dr Annie Lau – annie.lau@mq.edu.au, mobile: 0431 599 890, Australian Institute of Health Innovation or Cynthia Stanton, General Manager, Primary Care Advancement and Integration, Sydney North Health Network cstanton@snhn.org.au, phone: 9432 8237.